For a comparison of quality measures with more basic InterSystems IRIS Business Intelligence model elements, see the chapter “Summary of Model Options” in Defining Models for InterSystems Business Intelligence. A quality measure is similar to a calculated measure that can be reused in multiple contexts. A quality measure is defined by a formula that combines MDX expressions. You specify the subject area or subject areas in which it is available, and you can control whether the quality measure is published (and thus available in the Analyzer). Each quality measure is an InterSystems IRIS™ class definition, specifically a subclass of %DeepSee.QualityMeasure.QualityMeasure. You can define quality measures either in the Quality Measure Manager or in Studio. This chapter discusses the Quality Measure Manager. Published quality measures are displayed in the Analyzer, in the Quality Measure section of the left area. You can drag and drop them into pivot tables. In the Management Portal, select Analytics. Select Tools > Quality Measures. View summary information for the existing quality measures in this namespace. To do so, select Browse. You can then edit the measure or remove it. Create a quality measure. To do so, select New and then continue as described in the next section. For Catalog, either select an existing catalog or type a new catalog name. 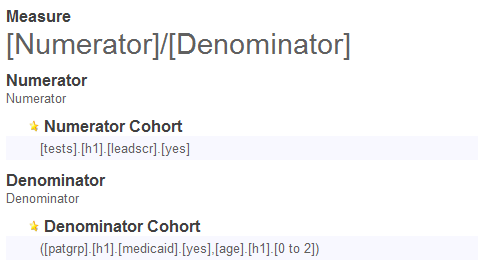 For Set, either select an existing set or type a new set name. For Name, type a name. For Class Name for the Quality Measure, type a fully qualified class name (package and class). 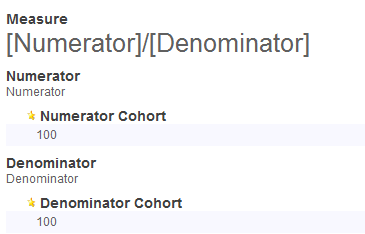 Where Numerator and Denominator are the names of groups defined in this quality measure. Each group consists of one or more items, each of which is defined by an MDX expression. In the initial definition of a quality measure, each of these groups is defined as a constant (100). The initial value of this quality measure is 1. Now you can modify the formula and make other changes. See the following sections. When you are done, select either Save to save the definition or select Save As to save it with a new name. When you save the definition, the system automatically compiles the class and writes the quality measure definition into a system global. Use square brackets around the name of any group that is used in the formula. 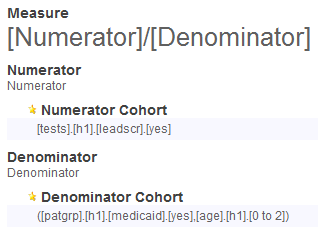 For example, use [Numerator] to refer to the Numerator group, if your quality measure defines such a group. Use any of the standard mathematical operators. Include numeric constants as needed. Include parentheses to control precedence as needed. Add a group. To do so, select the add button next to the Measure heading. Then edit the new group, which is added to the end of definition. Edit a group. To do so, select the edit button . 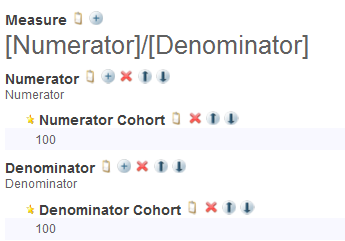 Then specify new values for Name and Description as needed, and select OK.
Add an element to a group. To do so, select the add button next to the group name. Then edit the new element. Edit a element in a group. To do so, select the edit button next to the element name. Then specify new values for Name and MDX Expression as needed, and select OK.
Change the order of groups within the measure definition or change the order of elements within a group. To do so, select the up and down arrow next to the item that you want to move. Delete a group or an element. To do so, select the X button next to the item you want to delete. The system prompts you to confirm this action. A reference to a member, as shown in the example. This is the most common kind of expression used in quality measures. A member is a set of records, and a quality measure usually consists of comparisons between different sets of records. Most other kinds of member expressions. Numeric literals such as 42 and other kinds of numeric expressions. You can, for example, use functions such as AVG and COUNT. String literals such as "my label" and some other kinds of string expressions. The PROPERTIES and IIF functions are not supported here. MDX Expression cannot be a set expression. You can, however, use %OR to enclose a set and return it as a single member. Search expressions are not supported within quality measures. For information on creating MDX expressions, see Using InterSystems MDX and the InterSystems MDX Reference. The formula for the quality measure (shown below the Measure heading) determines how the groups are combined. For each group, creates an MDX set expression that combines the elements in that group. Evaluates each group and determines its value. Combines the group values as given in the formula. Note that a quality measure can define groups that are not used by the formula. This can be useful if you are using the special [%QualityMeasure] dimension to refer to groups, as described earlier in this chapter. Edit an item. To do so, select the edit button next to that item and then specify the details. Add an item. To do so, select Add Meta Item. Subject Area  Specifies the cube or subject area in which this quality measure is available. To specify multiple cubes or subject areas, edit the quality measure class in Studio. 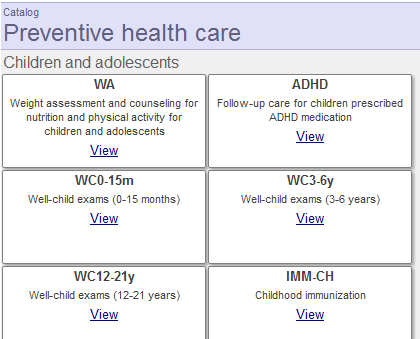 Note that the quality measure is automatically available in any subject areas that are based on any cubes in this list. Published  Specifies whether this quality measure is available in the Analyzer. Link to additional info  Specifies a link to a URL that contains any additional information. 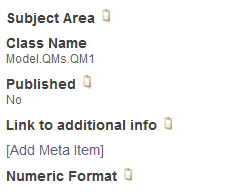 Your custom items  Specify any additional information to display in the Quality Measure Manager. The system does not use these items. A linked quality measure is an alias for another quality measure (the master measure). The master measure may or may not be published, and can belong to a different subject area. The system closes the dialog box, and the middle area of the page now displays the initial definition of the quality measure. For Linked To, select the parent measure and select OK. If you specify Linked To for an existing quality measure, the editor discards values for any optional properties of the measure. Other options are inherited from the master measure.